Sometime last month, I saw an online article from Atlanta Magazine about a new Latin restaurant that had opened (or was about to open) in Smyrna, Porch Light Latin Kitchen. * Always excited when something new opens OTP on the west side, I googled their website and saved it in my phone. I’ve thought about going a couple of times, but they were both on one of the two days that they’re closed (Sunday and Monday). We did not have a reservation, and as the space is small they do recommend those for dinner. But the helpful young lady from the parking lot (who was the hostess) took us to a couple of seats at the bar, “right next to Andre”. Andre turned out to be Andre Gomez, the chef-owner. I took the chance to ask him, as he was standing right there next to me, what was the best thing on the menu. He recommended one of everything. We chatted quite a bit pre-ordering and pre-food delivery. I asked him what led him to open a Puerto Rican restaurant in Smyrna. He said that he lived nearby and he wanted this to be a neighborhood kind of place, except your neighbors is from Puerto Rico. He’s not new to the Atlanta restaurant scene, having spent the last six years at Kevin Rathbun Steak, most recently serving as the chef de cuisine. That hands on chef-owner vibe shows. We were at the mid-point of the bar with a clear view of the stove, grill and most of the kitchen, and there he stood, watching everything come out of the kitchen and delivering much of the food himself. And as things got busier during the evening, he put on his apron, went around back and began cooking himself. Sourcing everything that they can locally (“I haven’t found a place around here that grows plantains”), the focus is on fresh ingredients and Latin flavors. This little fella came out of the oven. 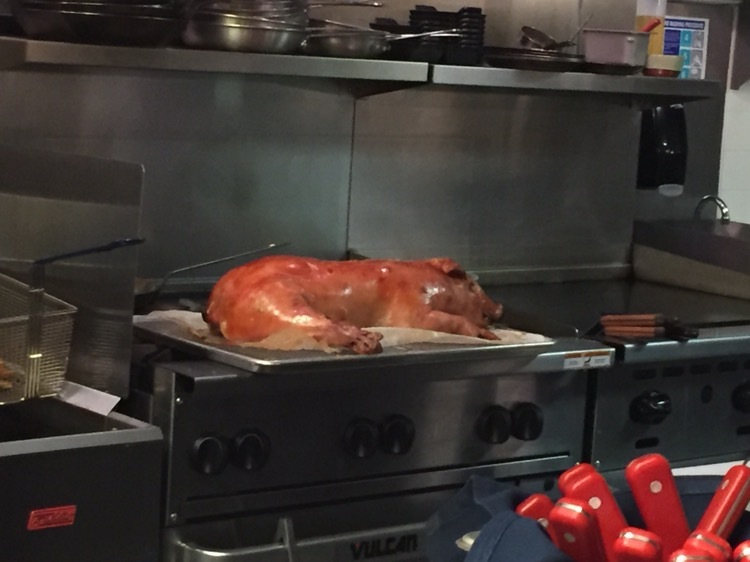 In chatting with one of the cooks (they were very friendly), and with Andre, and with the server we found that this is the “Little Roasted Piggy” from the menu, a 22 to 23 pound cochon, that will feed 8 to 10 and requires 3 to 4 days notice for them to get one in. We immediately began thinking of who we can invite to come back for that dinner (a report on that will be forthcoming in the new year). 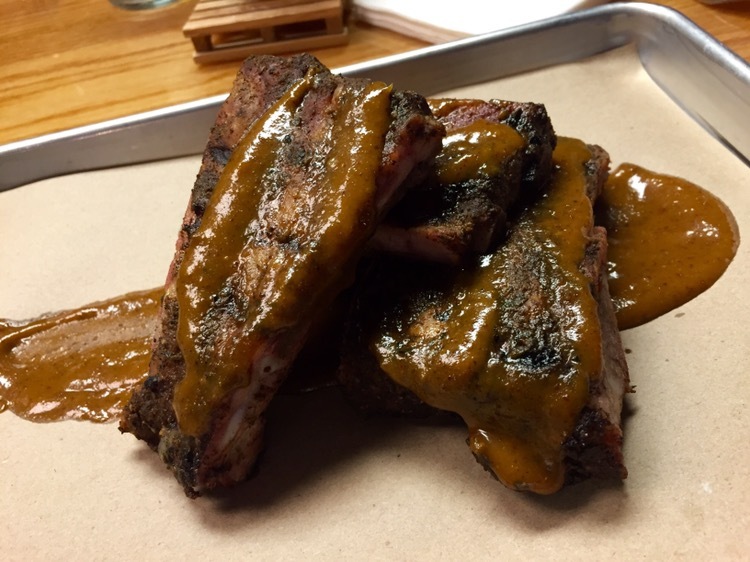 The second thing that happened was seeing the porkchop can can that they threw on the grill – a loin chop, complete with belly, ribs and skin. It started on the grill and finished in the deep fryer it. It looked amazing. Amazing to the point that I wanted to cancel my order and get one of those, or maybe order one of those for dessert or to take home – which we did discuss but determined would be impractical. 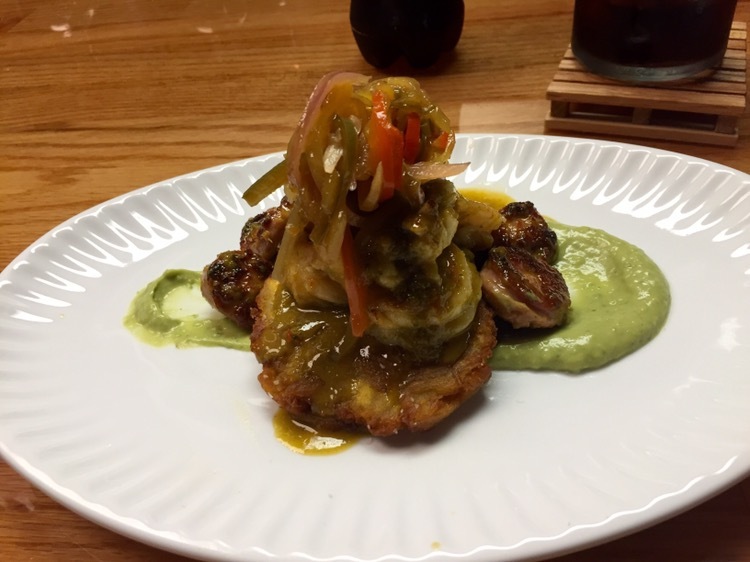 We started with one of the nightly specials, tostones with grilled shrimp and chorizo, on a bed of avocado purée, all topped with pickles and a lobster escabeche. This dish was perfect to share, as it contained elements that each of us likes better than the other. The sweet avocado puree mixed perfectly with the plantains and sauce from the toppings. Had there been one more tostone, we would’ve used it to wipe the plate clean before it went back to the kitchen. For an entrée, I had the cumin spiced St. Louis ribs with guava chipotle BBQ sauce and my beloved had the mahi tacos. The ribs were meaty and well flavored and when I added some of the habanero vinegar hot sauce, the flavor was enough to take the top of your head off. I really enjoyed them. 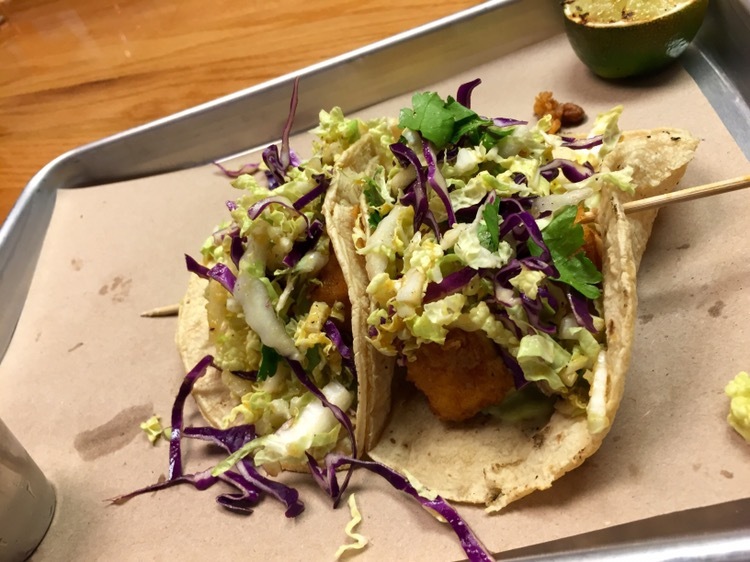 The cababbage slaw, pineapple vinegar and avocado puree on the fish tacos were excellent and the tortillas came fresh off the grill. They also grilled the lime, a touch I have not noticed before. 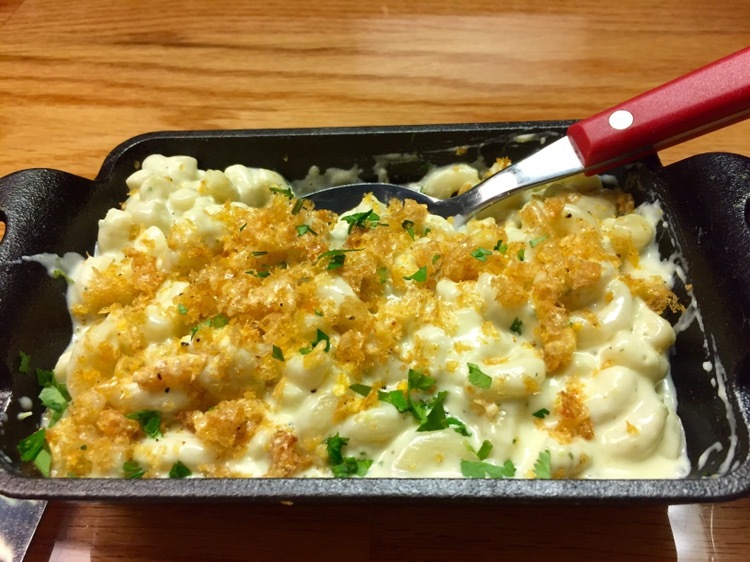 We also shared the soffrito mac & cheese, which with topped with crumbled pork rinds. We had debated between that and the red beans and rice. 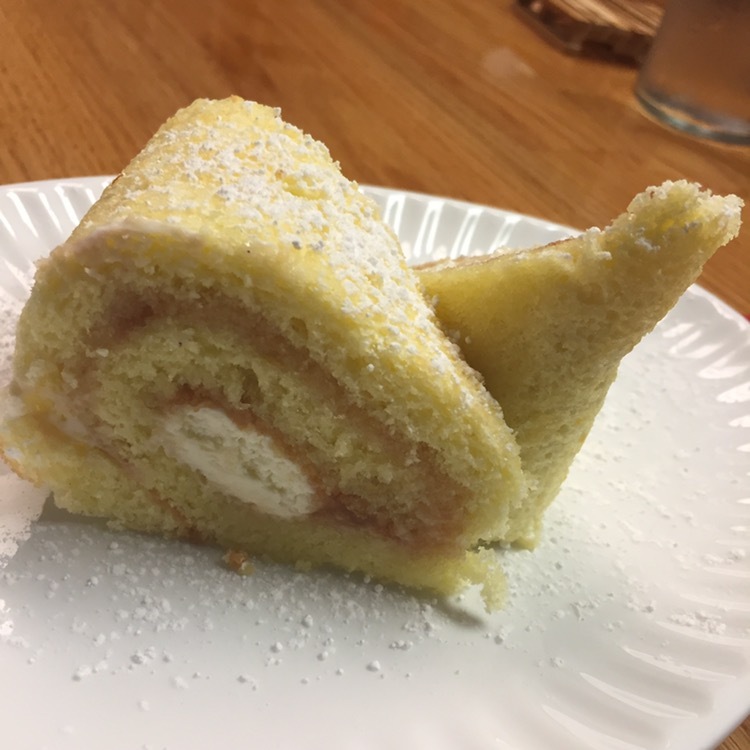 We finished the meal with a sponge cake with guava and ricotta cheese that was light, sweet and perfect for sharing. Friendly, attentive service. Excellent food. You really could not ask for more. Andre said, “I let the food speak for itself. And you speak for us.” It did, and I am. I’m a fan. *They’ve actually been open seven weeks.